At launch, Google Buzz is not a Twitter client. As the team explained earlier this week, they have about a thousand things they could do with the product, but haven't yet, and sending updates from Buzz to external sites, like Facebook and Twitter, is absolutely on the list. But while Google's developers work on improvements for the much discussed social aggregation service, the developer of Reader2Twitter, initially designed to post shared items from Google Reader to Twitter, has upgraded his product to share native Buzz items as well. 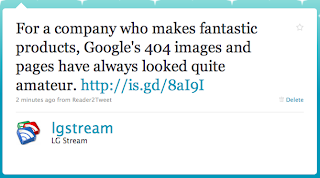 As I highlighted back in September, I set up a new Twitter account solely for my shares from Reader, and now those items which I post directly to Buzz are included in that stream at http://www.twitter.com/lgstream (or @lgstream). Now, native updates you make from Buzz, and not those pulled in by 3rd party services, will be sent in near real-time, powered by Pubsubhubbub, to Twitter. Thus far, the vast majority of activity I have with Buzz is shared from other services, primarily Reader. But the two native posts I made to Buzz, once I synched with Reader2Twitter, made it to the @lgstream account. Example: Buzz item | Twitter item. I have been using Reader2Twitter for about five months now, and it is practically seamless. So long as the hub from Google is working, it's good to go. You can get started here: http://reader2twitter.appspot.com/buzz.